Image created of structure S-80 along C-44 canal. ACOE web cam and Doc Snook, 2013. 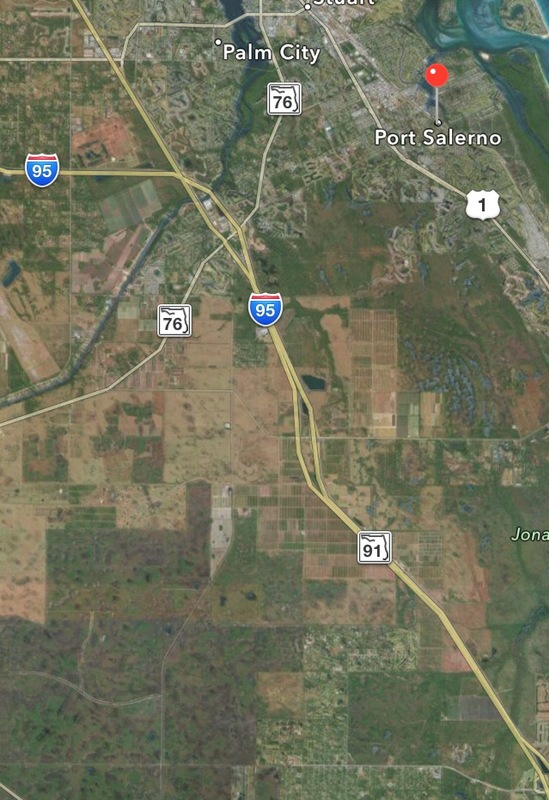 Link to video: Where “did” the St Lucie Canal connect with the South Fork of the St Lucie River? I share a video today that I believe to be my most “insightful” blog post since I began writing in 2013. The video above by my brother, Todd, who is an expert in historic map overlays merged with images from today’s Google Earth, communicates and educates in a manner no one map or document could do independently. 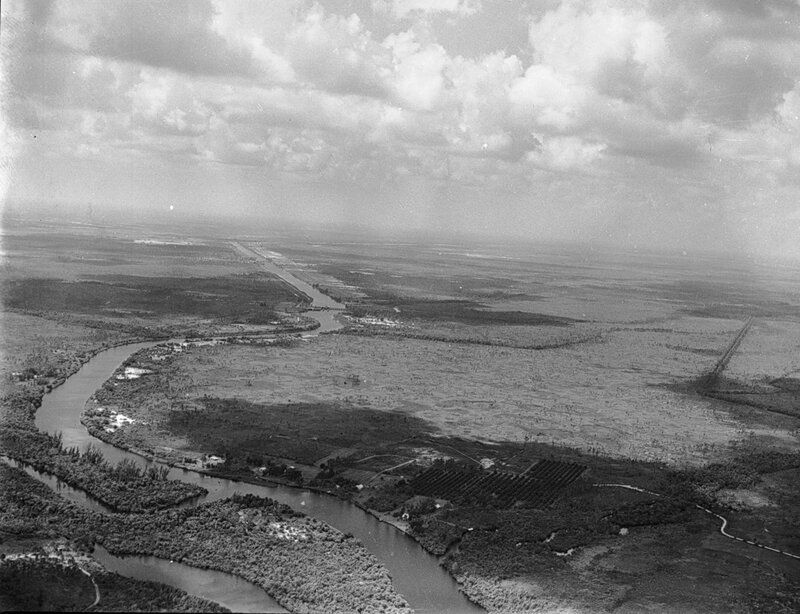 The video’s journey shows exactly where the C-44 canal was connected to the South Fork of the St Lucie River. 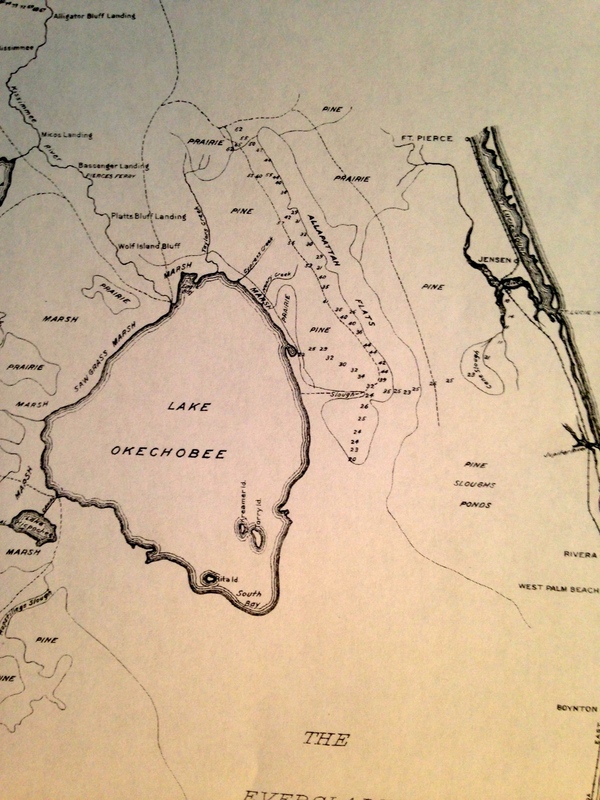 An historic Hanson Grant map reveals the “Halpatiokee River, meaning “alligator river;” with a basis in multiple Indian languages. 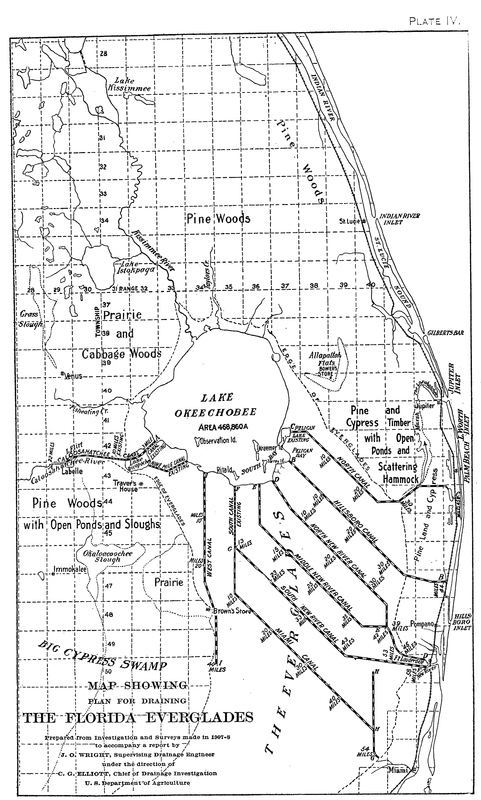 Because the St Lucie Inlet was not opened, the forks and river were “fresh,” thus alligators lived there. 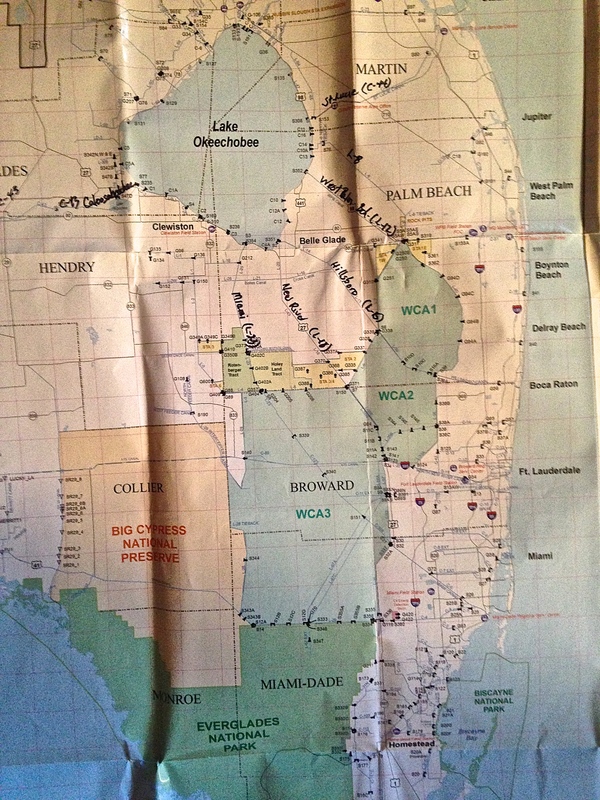 Then flying over a 1910 plat map of St Lucie Inlet Farms, you will see the South Fork of the St Lucie River mapped out. As the image changes over “time” you will see the construction of the C-44 canal, and how it was built right through the middle of South Fork’s north-western prong. In fact, those prongs today on the northerly side, are “gone” as sections 32 and 33 show. Those lands today are agriculture fields. As the journey continues, in the developed areas of St Lucie Farms you will see a very large lake “disappear” near section 25. I find all of this fascinating and kind of depressing… My brother said it best: “Wealth created at the expense of the environment…” Maybe we could create more wealth today going in the opposite direction? 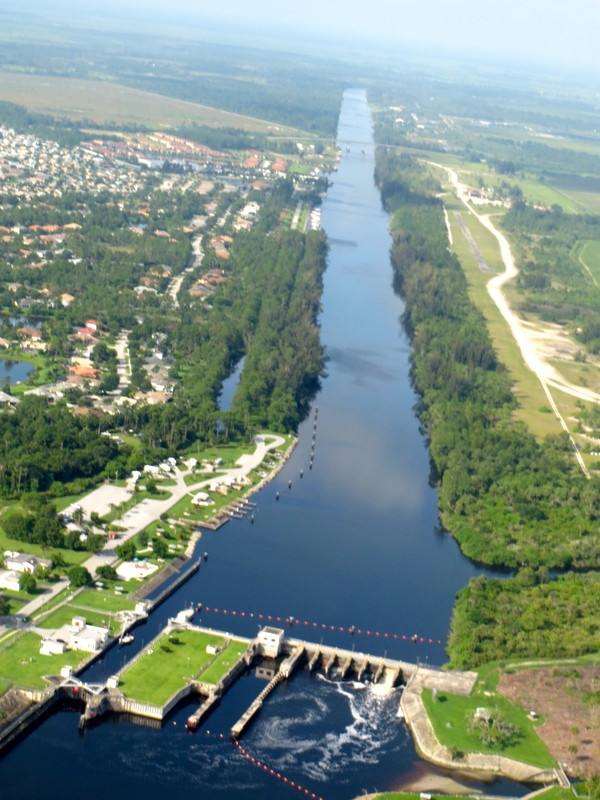 The canal was built by the Everglades Flood Control District and later the Army Corp of Engineers, at the request of the state of Florida and Stuart Chamber of Commerce head Capt. Stanley Kitching and other “leaders.” (From conversation with historian Sandra Thurlow). IInteresting isn’t it… to ponder what would have been different if the canal had gone through the Manatee Pocket instead? 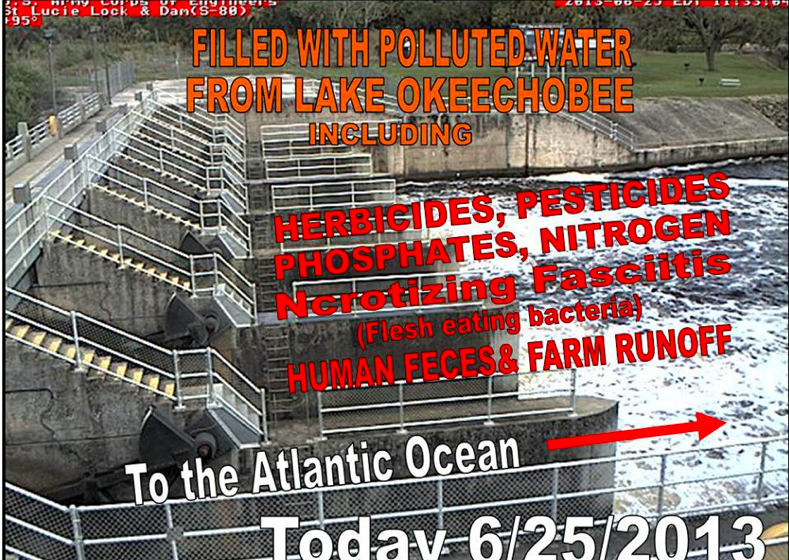 Certainly the St Lucie River would have been spared but the Pocket, near shore reefs, and inlet surrounding perhaps full of even more contaminated silt and high impact nutrients. Best of all the canal would have never been built but that reality we cannot change…or can we? Most important today is to know where we have come from so we can redirect where we are. 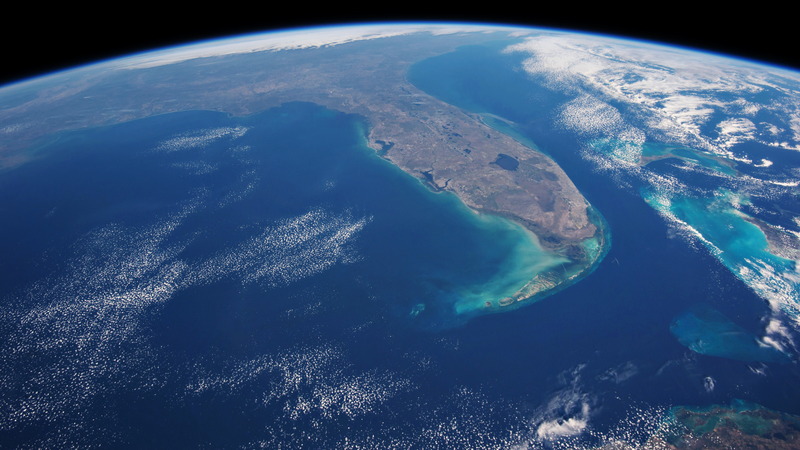 Please take a look at the very short video, put your thinking cap on, and let’s get the state, federal and local governments delivering on what they have documented as problematic for Florida’s waters since the 1970s. Only the people will change this problem, not the government. Some good history, Jacqui, but you leave out all mention of the sugar industry’s reclamation projects, which are the main reason, by far, for the discharges into C-44. This was planned in order to protect the EAA’s extreme over-drainage. 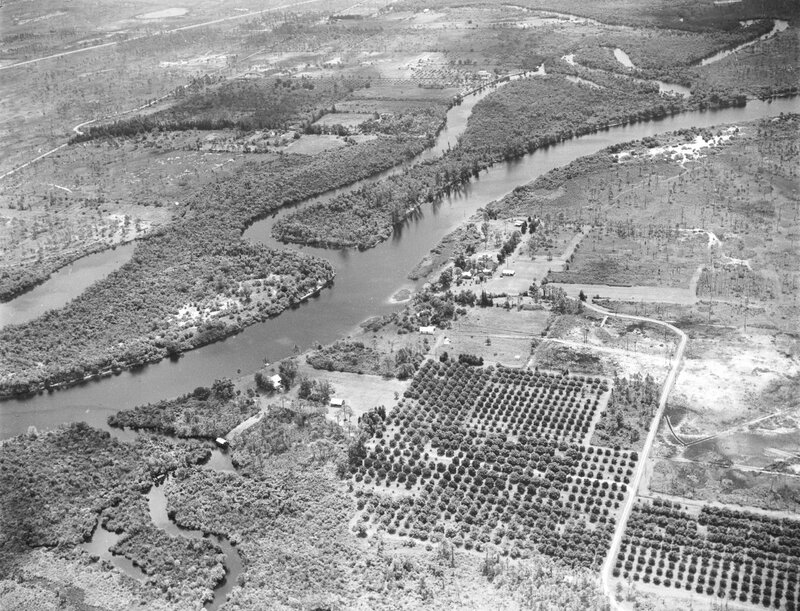 The discharges have swelled as the sugar industry grew from 50,000 acres in 1960 to more than 400,000 acres nowadays. That’s an EIGHTFOLD INCREASE. And that’s the reason for the degradation of the estuaries, all with the help of key politicians. We must have new leaders with new thinking. Yes Karl–I did not get into that with the sugar industry. I believe I have in other blogs. Thanks for your comments to make sure that in noted. If you get a chance visit your local fishing marina and ask what fishermen do when they catch a shark. Your area is(or was) also an important sailfish sponing area. 2 weeks ago I saw a spotted eagle ray that had its wing bit half off. It was still able to survive. What I am trying to bring across is situation is not normal when millions of people all release sharks. Ecosystem is way out of balance and all the creatures suffer because of this man made disaster.It is the same with gators. When there is an occasional gater or shark everything is fine . He will take the weak and sick and ensure a heathly population of other creatures . But when the balance is out gaters and sharks are both skilled enough to kill everything . The whole attitude of these large preditors changes. Healthy prey like sailfish that could escape 1 or 2 sharks are no match for 100 or 200.Everytime I went to the beach in your area I could sit and watch thousands of sharks busting the water close to shore. Thank you Alice. I am loving your Everglades census stuff. The ammount of wind that blows over Stuart is not a problem and I think the amount of water that flows through the c-44 locks should not be a problem either. The violent action should be increasing the reaction of acids in the water with calcium ,releaseing massive amounts of desolved oxygen. The trees should be white with birds and schools of menhaden and mullet should stretch for miles behind the spillway. I have an open mind but the C-44 thing is tough Brent.